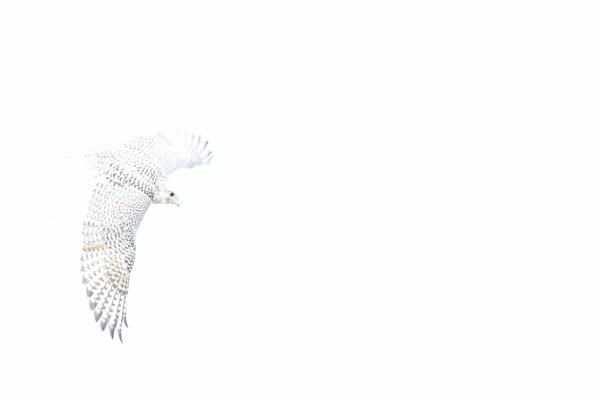 This last week I was out with a falconer that had an absolutely stunning pale form Gyrfalcon (Falco rusticolus) and the beauty of this wonderful bird really touched me. Well, to be honest, seeing this stunning raptor with jesses on a pole in an SUV wasn’t exactly the happiest of moments, but as soon as he took to wing, he blew my mind. A few months ago, James Currie wrote a very interesting piece Falconry – Bloodsport or Alternative Form of Birding? about his experiences with Harris’ Hawks (Parabuteo unicinctus) as falconry birds in the Sonoran Desert in which he discusses various pros and cons of falconry. James’ expression of his feelings and thoughts on falconry have helped me cement a little in me how I feel/think about it. But I still am nowhere near to being clear. In the 1970’s and 1980’s, organizations like the Peregrine Fund effectively used captive breeding of – initially – Peregrine Falcons to re-establish wild populations and effectively changed the course of the peregrine’s future. Hundreds of individuals around the USA and the entire world dedicated their lives and hearts to working on raptor conservation – much of which was centred around the activities of passionate falconers. 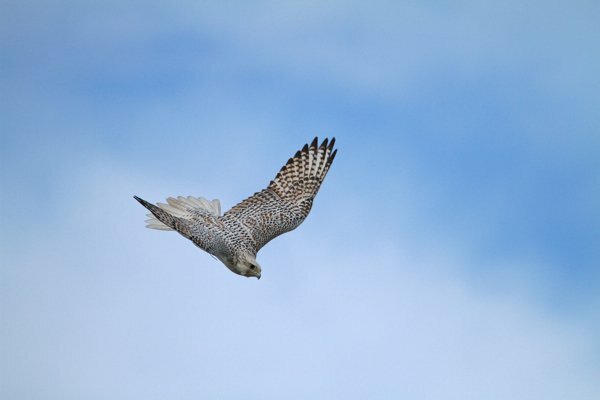 With the initial successes of the work with and on the Peregrine Falcon other raptors in need garnered more attention. I really have no idea how it might be possible to quantify the real effect – direct or indirect – that falconers have had on the health of world raptor populations; but I suspect that the indirect influence of their passion for birds of prey may have been huge. The thing is, when anyone is really enthusiastic about anything – be it fighter jets, rare books or raptors – that enthusiasm tends to be infectious in that they seek out people that are open to their interest, and enthuse a wider circle of people. Reminds me of gull people. But on Gulls: terribly boring creatures that people like Alvaro Jaramillo try (rather successfully) to convince us are cool. 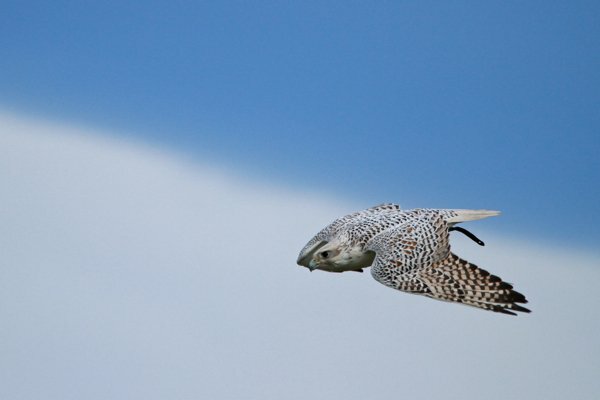 But after having seen this gorgeous Gyrfalcon come to life on the wing, the bunny-hugger in me struggles to come to terms with keeping such a majestic flyer in captivity. And I had the same misgivings about captive parrots. The day I saw my first wild Cape Parrot (Poicephalus robustus), something changed in me. Now that is some food for thought! You provocateur! Can we just copy and paste comments from James’ post? or do we need to wade through all of that again. So long as they are not stolen wild birds… and get plenty of flying time, I’m not particularly bothered about this. @Duncan, how about chicks of stolen wild birds? or a Gyr- Peregrine hybrid? Dale, I totally get “just working through something(s)”. There are a lot of ethical and political conundrums I’m working through myself. When it comes to falconry, I’m in the same boat with ya…a bit confused about wild vs. captive, yet amazed at the skill of the bird and handler, impressed by the rich history between man and bird, and grateful for the conservation help from falconers. Beautiful images Dale! I actually just went out with Jonathan Wood in Maine to film some of his birds and there can be no doubt as to the passion of falconers. Seeing the looks on groups of kids faces (who otherwise have very little contact with nature) as they learn about birds from responsible falconers is something incredibly powerful. I’m totally with you on the trade in rare parrots, esp Cape Parrots! But falconry is a little different as these birds have the luxury of free flight. I think this debate is both interesting and useful and so important for people to air their views in a respectful manner. Confused or not, I think we can all agree that birds like Gyrs are STUNNING creatures. And we can all learn from this type of debate. Thanks for the awesome images. Dale – the falconer has stolen birds ergo not good. I assume there are birds that have been bred since when it was legal to take them from the wild. @James, very good point – these falcons get to fly free. unlike the average pet parrot or bird in a zoo (or raptor park for that matter). I’ve been torn on this issue for a few years now – since I worked for a short time at a renowned falconry/raptor conservation centre/hospital. In fact I even discussed this a few times in the last couple of weeks. I don’t want to make this comment a teal deer but, having seen first hand both aspects (the rehab/conservation side and the leisure activity/entertainment side) I’m leaning towards “It isn’t ‘good’ unless it is for rehab or conservation purposes” and I don’t think it’s going to change. When the birds are not being used for conservation/being rehabbed then I don’t see how it can be defended as much more than a hobby (a bloodsport? ), no matter how much people love the birds. I am definitley not speaking for the entire world here, but these days many people involved in falconry do not NEED to use a bird to kill their food for them, certainly here owning a raptor is a luxury, so the working animal arguement always seems a bit of a stretch to me too. @Crowbones, some really interesting points you have there. Thanks for entering the discussion. @Dale; I’m not sure the fact that some people do it in a bad way is a good reason to go after the people that do it right. There are plenty of activities that are done in bad ways; birding, diving, tramping, pleasure boating, and so on, that are fine if done responsibly but damaging if done irresponsibly. Should people who obey the rules should not be punished, those that don’t should. I’m really, really, profoundly unimpressed with the utilitarian arguments against falconry. Of course no one needs to fly hawks. On the other hand, no one needs to draw, or paint, or sing, or dance, or write, or read, or play. (Or watch birds, for that matter.) But how impoverished an existence must one lead to satisfy the emotional prejudices of other people? Falconry has been proven to have no deleterious effect on populations of either the raptors employed or the quarry pursued, so there can be no rationally compelling argument against the practice. All that is left, then, is the vague sense (on the part of some minders of other people’s business) that “this isn’t necessary”, or “aesthetically justified”, or what have you. Can we agree to live and let live? I won’t interfere with anyone else’s unnecessary enjoyments if they’ll accept my right to mine. @Mark – I haven’t argued against falconry. I answered the question in the post title which is “Is falconry a good thing?” and I think, no, generally not a good thing, I haven’t said I thought it was a *bad* thing or it should be stopped. Just because someone does not personally like something or that it isn’t outright beneficial does not mean they think it needs to stop or is harmful. I simply disagree with most of the arguements (which are pretty utilitarian in nature) for it provided by most of the people in favour of it who I have communicated with, or for that matter, just read. I tend to think of falconry a bit like I think of ferreting. @crowbones – Sorry if I overstated or misrepresented your position. Not your cup of tea? Fine with me. I suppose you’ll just have to taake my word for it when I say that falconry is a positive good for me and for many of my friends, just as music and art are for many others, and that it can be (and has been) good for raptor populations as well. Falconers have traditionally been the first (and occasionally the only) people to advocate for birds of prey, and as has been noted, the technical expertise of falconers can be valuable for wildlife management as well as rehabilitation purposes. And I have seen first hand how many falconers have done and are doing an enormous amount of good for bird conservation and welfare and I fully support them (and have personally benfitted from the bird handling & management experience). Aside from that aspect, I just think a private individual flying birds as a hobby (and if you aren’t involved in rehab/captive breeding or dependant on the bird for your livelihood then why else?) is no more good or bad than something like ferreting or horseriding. Any ‘good’ that comes of it is down to the falconer not the activity. @Mark and Duncan, thanks for sharing some good points. I love skiing and in the winter I do it as much as I possibly can. But this sport has some very major consequences for our mountains – slopes are bull-dozen in the summer to get them free of stones, and huge lift systems and their associated access infrastructure have an undeniable effect on the local environment. If we think about it, we all have conscience conundrums within us – and they are normally not that deep at all. All the falconers I have met have been very passionate about birds of prey – this is inevitably great for raptors and raptor conservation. But I have my doubts that the norm in Europe and the US can be assumed to represent the whole world. It might be worth thinking beyond the shores of the USA when suggesting falconry has no negative impacts on quarry populations. The Houbara Bustard is listed as vulnerable and to quote the birdlife international species account ‘The principal threat is from hunting by Middle Easten falconers, largely but not exclusively on the species’s wintering grounds…’ I have heard of reports of falcons that are bred in the states trained to hunt greater prairie chickens (listed as vulnerable itself) and then shipped to the Middle East to hunt bustard. Hi Dale, I’m a falconer from east Texas, and I’d like to give you some information. Falconry is a good thing if you care about the preservation of birds of prey. Let me elaborate. The average raptor has a 90 percent chance to die in its first season. Of the 10 percent that survive that, the average life span in the wild is 2. Falconers know we can not truly make a large impact on this fact. There is simply no way, with only 5000 of us in the U.S. But the personal satisfaction of capturing a wild, first year bird, and getting it past that first season is a feeling worthwhile. Stealing babies? Perhaps one could call it that. However, keep in mind that not only would at least one bird have to be left in the nest(by law) and the birds have died without such capturing, the parents have no love for the baby, and in fact a complete disregard for it after its grown up. All parents who ever see there children again at the nest will shoo away, or more commonly, kill the child, unknowing of their relationship. Falconry is a sport. And an art. But also its a chance at giving life to the most wild, majestic animals this planet has to offer. Its not like the bird can run away anytime it wants. Its not against its will. And all we do is slowly help the population grow. Hi, I am a falconry enthusiast and am training to become a falconer myself. I’ve read a couple of the comments and some of them seem to be made from a relatively uneducated (as far as falconry goes) point of view. Raptors in the wild generally only live about 3 years, 5 if their lucky. Most species can reach around 10 to 50 years in captivity depending on the type of bird. not to mention at least 50% of raptors die before their 1st year. Oh, and by the way, crowbones, if something is not good, then doesn’t that make it bad in definition? My brother has been wanting to buy gyrfalcons for a while, and I think he’s finally in a place to be able to do it. I’m glad you talked about a few falcons, including gyrfalcons in your post. I’m going to have to see what I can learn about becoming a falconer and see what I find!